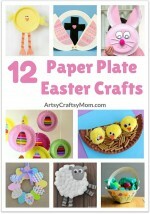 Easter traditions vary around the world. In most parts of the West and Europe, Easter eggs are a significant part of the celebration, with decorating, hunting and gathering them going on in full swing. Some countries have a trick-or-treating style, where kids go around collecting candy from houses. There are even places where spanking is part of the Easter celebrations!! Along with eggs, rabbits are also a common feature, probably because they represent fertility and the birth of new things since Easter is during spring. 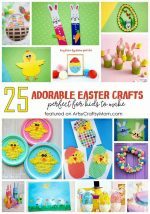 So today, we’ve got a Quilled Easter Egg Craft that includes all the elements of an Easter celebration – rabbits, eggs and the greenery of spring – all in a cute little craft! 5 mm quilling strips (yellow, red, three different shades of green, white). Quilling needle or tooth pick. 1. Let’s start by making the leaves using the green strips. As you can see in the image above, the leaves are of different shapes and sizes. Start with a tear drop shape and then adjust it to get the different leaves by pinching the ends. 2. Next are the flowers. Use the red strips to make loose coils and then make folds inside each coil. Make multiple flowers in different sizes. 3. Let’s move on to the bunny. Make a tight coil with three white strips for the bunny’s face. For the ears, make tear drop shapes and pinch them. 4. It’s time to do the egg! For the outline, we need tight coils in yellow, each made using a full strip. In the picture below, I’ve made 28 coils, but you can make as many as you need. 5. Once all the coils are ready, arrange then in an egg shape and stick them. Leave them to dry for a while. Once dry, wrap a green strip all around it and inside of it. 6. Let’s assemble all the elements together. Start with the bunny by placing it at the base of the egg. 7. 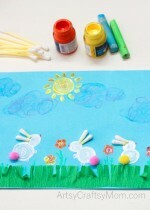 Arrange the leaves around the bunny, and fix the flowers to the branches. 8. 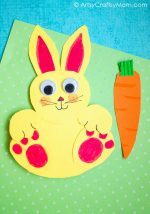 Use colored markers – red for the bunny’s ears and black for facial features. Your Quilled Easter Egg is ready! This craft is great as a joint effort – you can bond with each other while creating those coils and putting them together. 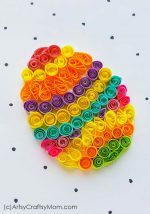 Use this Quilled Easter Egg on a greeting card, wall art or just card stock to make a cute little Easter or spring themed decor element!